Expanding a model railroad layout with a theme world or even entire time periods is an absolute must for all model railroad fans. Our new locomotive shed kit fits into this ideally. 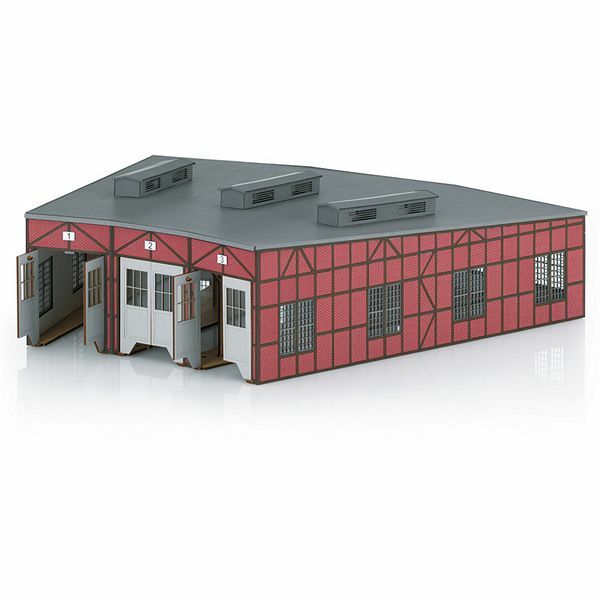 This kit is an absolute highlight in the usual Märklin quality and includes doors that close automatically when a locomotive enters the shed. Expanded to a roundhouse and supplemented by a turntable, this will soon be the favorite place for your locomotives. Model: The stalls are arranged on 12° angles. This kit goes well with the 74861 and 66861 (Trix H0) turntables. This kit can be used with C Track and K Track (track not included). The usable track length in the shed is about 30 cm / 11-13/16". The doors to the stalls close automatically when a locomotive enters a stall. The kit includes a set of lights with 6 maintenance-free LEDs, wired and ready for installation. A set of intermediate supports is included for connecting several locomotive sheds together without intermediate walls. Servos available in hobby shops and train specialty shops can be installed in the locomotive shed. Size 332 x 401 mm, height 115 mm / Size 13-1/16" x 15-3/4", height 4-1/2". Can also be used for two-rail track systems. Doors included that close automatically.